Don't get caught off guard when playing a round of 9 or 18. With our retro-inspired Golf Kit, you'll have everything you need for a day on the green. You can even pack a lunch in this easy to carry box. 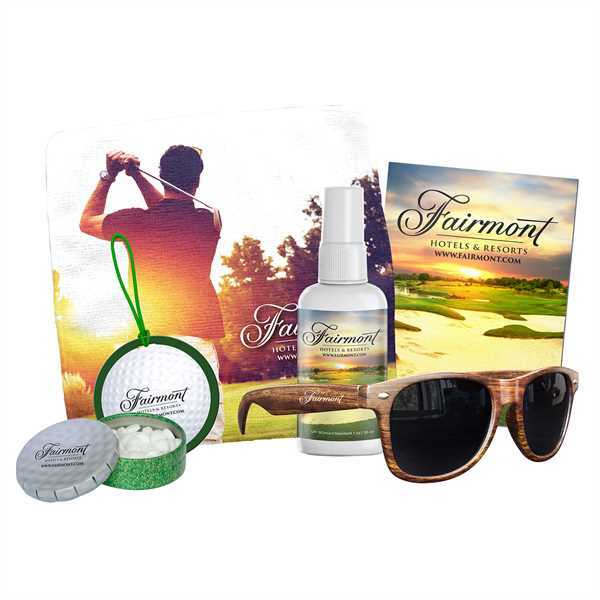 This kit comes complete with insect repellent with built in SPF 30, mints, a microfiber towel for cleaning equipment, luggage tab and a pair of wood-tone sunglasses to block out the sun. It makes a great giveaway for golf tournaments, corporate conventions, annual retreats and much. Don't forget about our customization options for maximum brand exposure! Price Includes:imprint on each item.